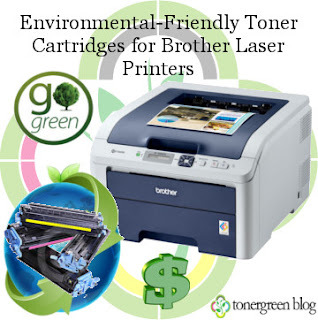 Environmental-Friendly Toner Cartridges for Brother Laser Printers | TonerGreen - Eco-Friendly Toners from the U.S. Brother Industries also known as "Burazā Kōgyō" is a multinational Japanese company famous for manufacturing sewing machines, electrical equipments and large machine tools. But out of all its products, Brother's laser printers and multifunction centers stand out. Brother's printing machines are designed expertly to produce professional-looking output and enhance productivity in a working environment through their set of advanced features and one of those is their printer's "eco-features". Regarding itself as an environment-conscious company, Brother Industries committed itself in manufacturing Energy-Star Qualified laser printers and MFCs with unique "eco-features" such as energy-saving mode, auto-duplex printing, auto-on/off technology and toner-saving options. This act is a part of their campaign "Brother Earth" that comes with the tag-line "Working with you for a better environment." This makes Brother Industries popular not only to value-conscious customers but as well as for go-green supporters. Not only can they attend to one's printing needs but as well, help the environment from producing less carbon and conserving energy through its green features. However, if you already own a Brother laser printer at home or use one in your office and still want to contribute to the environment then using environmental-friendly toner cartridges as replacement cartridges for your Brother laser printers and MFCs would be the wisest choice. These eco-friendly Brother toner cartridges are refurbished OEM cartridges that are then refilled with new toner and re-sale. These cartridges are known in the market as remanufactured toner cartridges. TonerGreen is one of those trusted online providers of quality eco-friendly Brother toner cartridges that are quality-tested, guaranteed to work smoothly and deliver the same performance as that of original toners. Moreover, with TonerGreen products, you can save as much as 60% and help save our planet at the same time. Our in-house manufacturing facility ensures that all our remanufactured toner cartridges are of excellent quality to match OEM standards. 100% Guaranteed.